Representatives from Distance Education Visual Arts Network across New South Wales have been meeting for an annual conference for over 10 years, making the Visual Arts network the longest running distance education network in New South Wales. This significant annual event is organised by Sydney Distance Education High School every second year to coincide with the Biennale of Sydney. The regional Distance Education centres share the organisation of conferences in their regions every other year. This year Karabar Distance Education Centre hosted the conference in Canberrra on the 21st and 22nd of June under the guidance of Head Teacher Creative and Performing Arts Anne Hodgson. 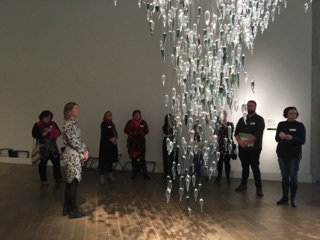 Network members braved the chilly Canberra weather to arrive at the National Gallery of Australia for an introduction to their current education programs and resources from Mirah Lambert, Senior Education Officer. 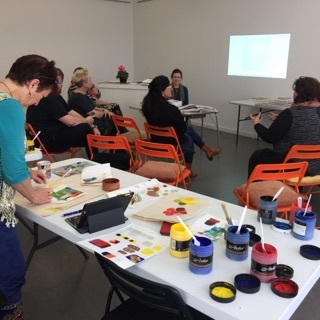 Current member of our network, Sueanne Matthews, who was awarded a NSW Premier's Teacher Scholarship to travel to Taiwan presented an overview of the artists that she met and worked with in her time there. We then walked through three of the exhibitions with education officers and curators who provided informative floor talks. 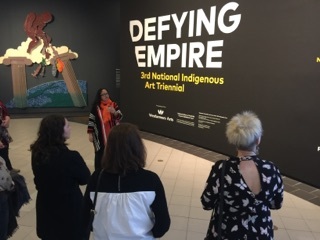 These included, Defying Empire, the National Gallery of Australia's third National Indigenous Triennial. Network members were already discussing how to engage their students with these resources as we prepared to share our recently developed programs and discuss our experiences in using a range of digital lesson delivery methods for online learning. In our 2016 conference evaluation, attendees overwhelmingly noted that there were enormous benefits from the sharing resources and the support through educational and pedagogical change in our schools. 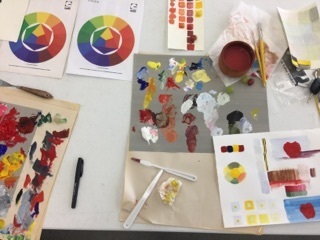 During the second day of the conference guest artist Dr Suzanne Moss from Australian National University provided a masterclass in painting and colour mixing. Network co-ordinator Lindie Matthews led a final discussion around how we will use our funds to best resource our network, current project funding submissions and future directions for the network.